The leisurely passage of the ancient Farman over the new types park. In the foreground the Merlin in the Hawker F.36/34 is being run up. 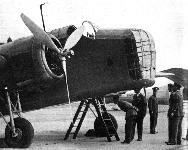 The Whitley heavy bomber is seen in the centre. 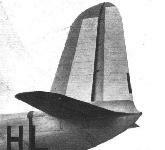 It is obvious that the Whitley is related to the A.W.23 bomber transport. 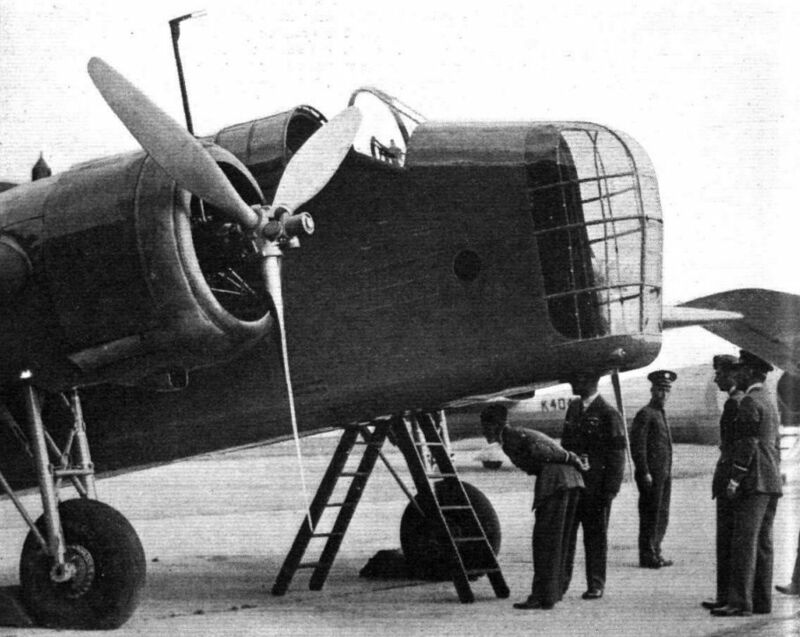 The Armstrong Whitworth Whitley, with two Siddeley Tiger engines, is in the heavy bomber class and of modern design. Handley Page medium bomber (two views). 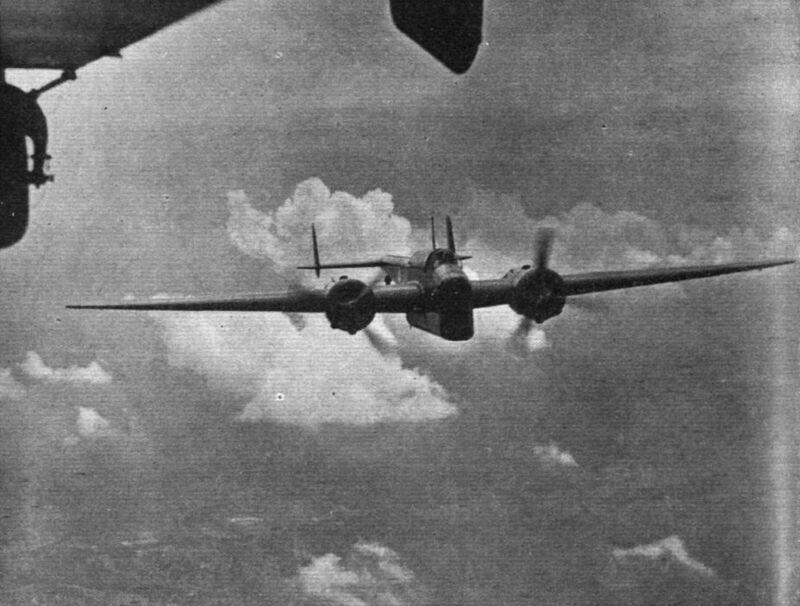 INTERCEPTOR FASHION: The climb of the new Handley Page medium bomber, in this striking picture, suggests the fighter of not so very many years ago. 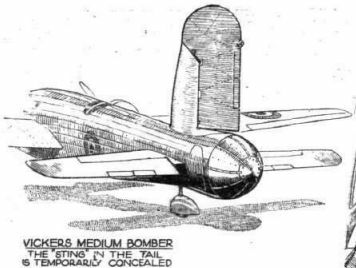 SLIM AND DARK: Off the ground, and with wheels retracted, the new Handley Page medium bomber (two Pegasus engines and C.P. 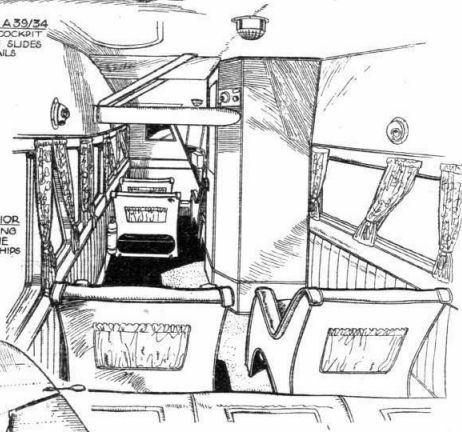 airscrews) has a sinister beauty of line. 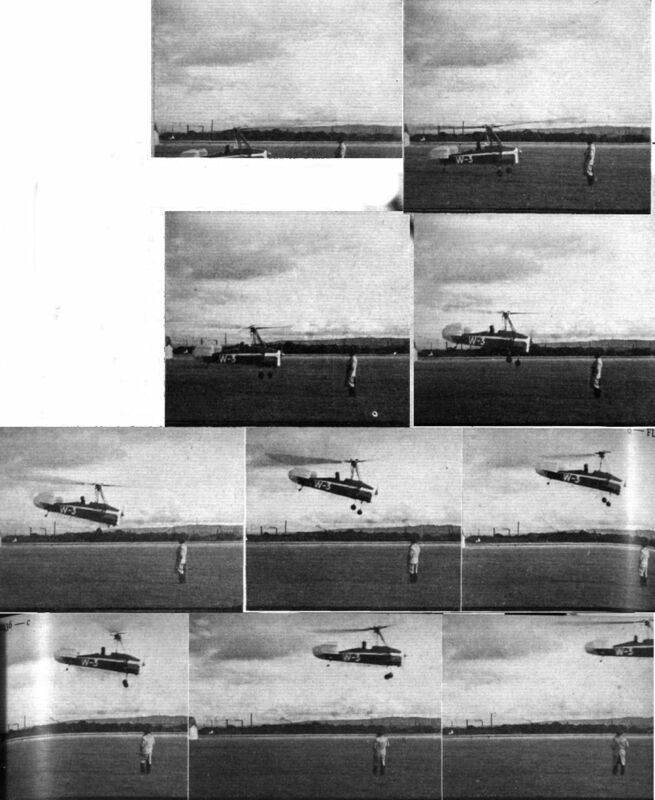 For this photograph - the first taken with wheels up - the machine was "posed" by Capt J. 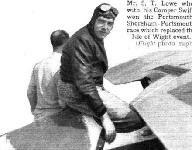 B. L. H. Cordes, the makers' chief test pilot. PRESENTED TO HIS MAJESTY. This view of the King studying the retractable undercarriage on the new Handley Page medium bomber during his visit to Martlesham last week is but another illustration of His Majesty's genuine interest in things aeronautical. 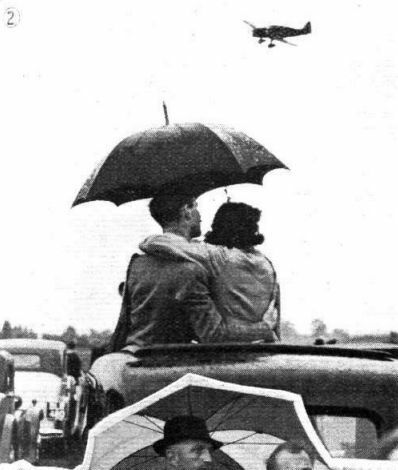 Keen interest in the Supermarine Spitfire, which gave a demonstration. 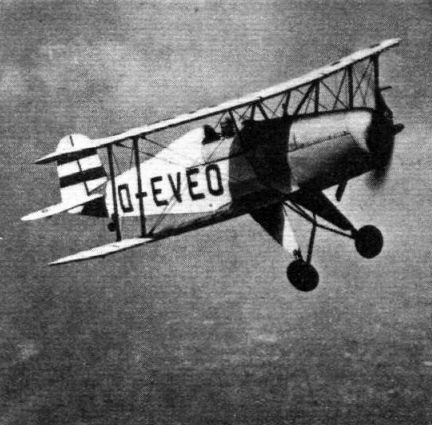 A Dewoitine D.500 fighter (650 h.p. 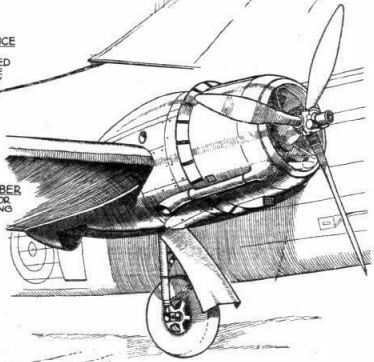 Hispano Suiza X engine); a type which figured prominently at the Le Bourget Meeting. This machine, and a similar type with 860 h.p. 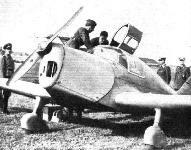 Hispano Y cannon engine, are the latest standard equipment of French fighter squadrons. 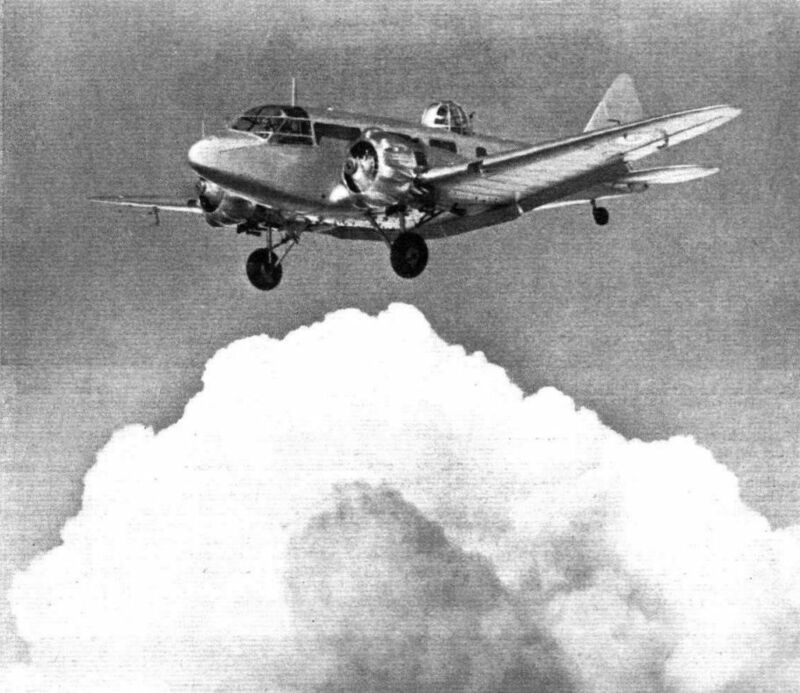 The D.500 is capable of 231 m.p.h. at 15,580 ft, and is armed with two machine guns. 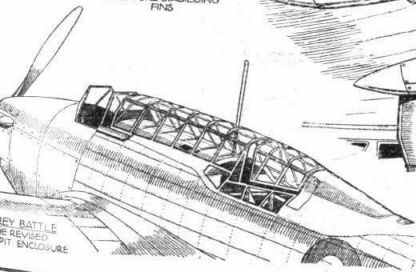 Three of the Fairey Battle's notable features are apparent here. They are the V.P. 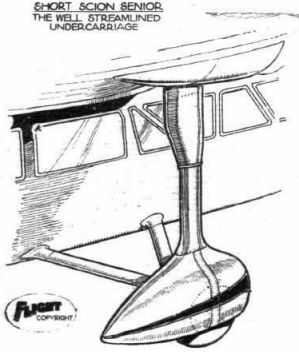 airscrew, the new "glasshouse" and the flaps. 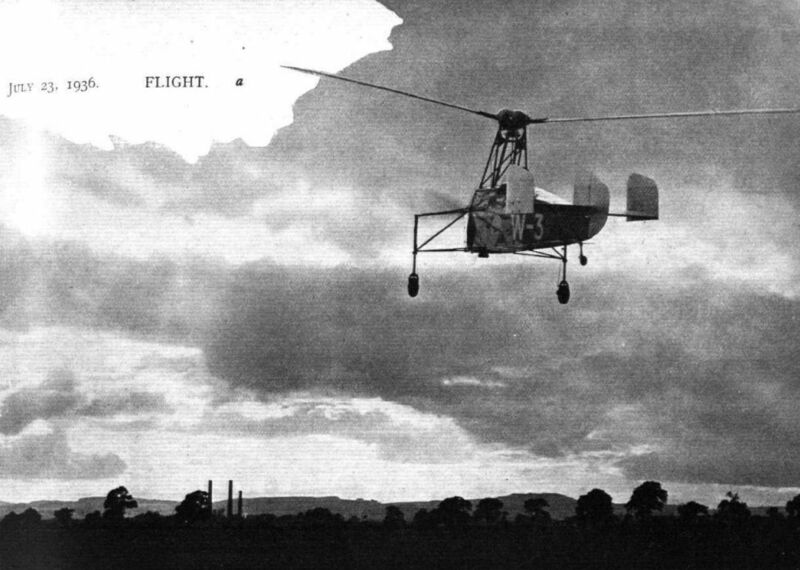 An almost perfect reconstruction - Mr. R. O. Shuttleworth's Bleriot, with a genuine three-cylinder Anzani engine. It took off and flew a short straight. The limit man (Fit. Lt. Bonham-Carter, with Lady Hoare as passenger) shows deep interest in Mr. Reynold's flag at the start of Saturday's final. The machine is a standard Miles Hawk Major. 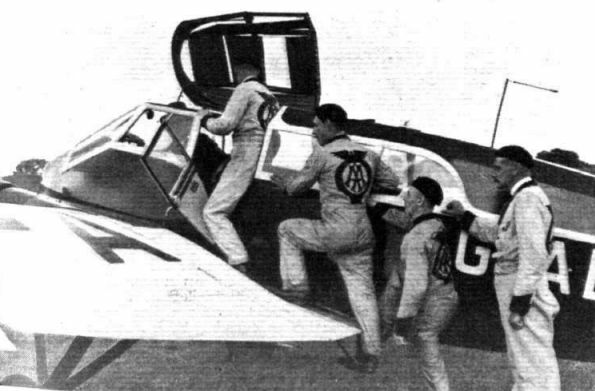 Phillips and Fowis were represented by the Hawk Trainer, the Nighthawk, and the Miles Whitney Straight, all fitted with Gipsy engines. Fft. 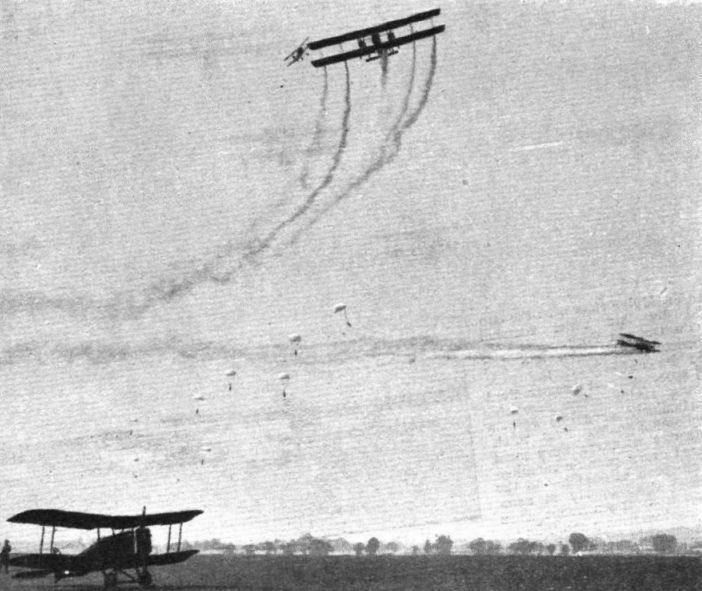 Lt. Tommy Rose in his Hawk Speed Six, with Gipsy Six R engine, puts in at Shoreham during the eliminating contest on Friday. 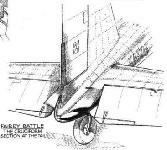 The latest design of Miles undercarriage fairing seen on the Sparrow Hawk. Weaving a plait in smoke - the Bulldogs of No. 54 (F) Squadron. 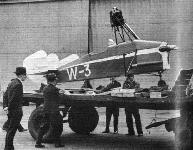 The Farman Horice - so called because it combined the features of the Henry and the Maurice. The reconstructed Wright biplane (seen being taxied along in front of the enclosures) was not too perfect a replica of the original. 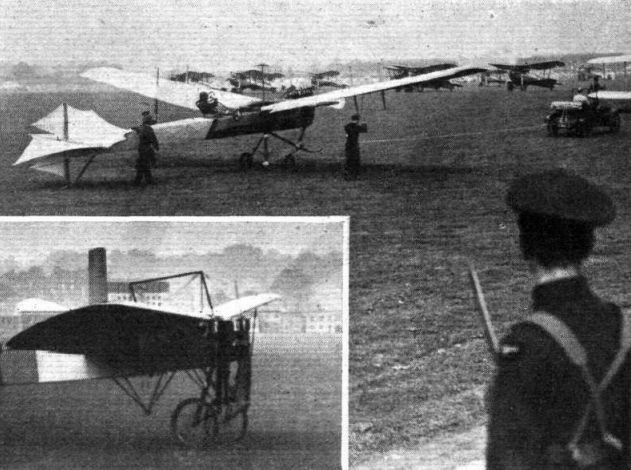 A sentry watches an aeroplane probably older than himself - the Antoinette monoplane of 1909-1911. 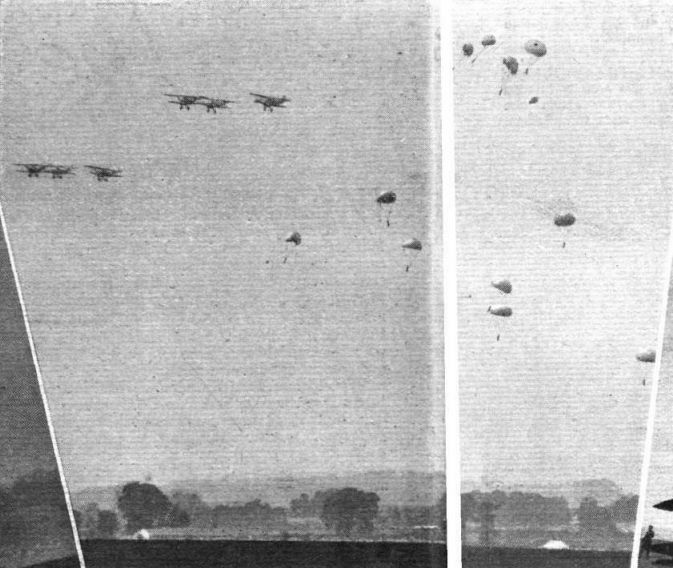 The trusty old Virginias' only (and probably last) Hendon Display item - parachute escapes by the "crews" of bombers attacked and set on fire by Gauntlets of No. 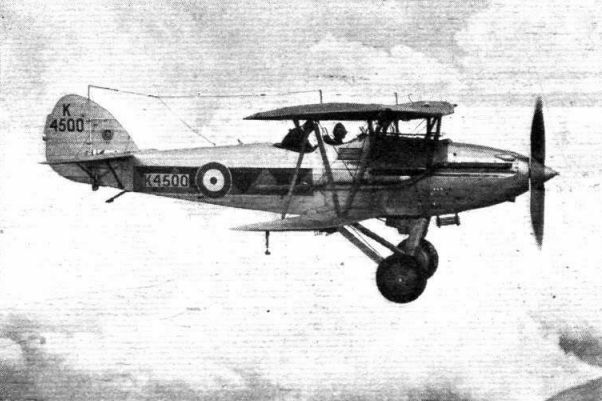 111 (F) Squadron; note the war-time S.E.5a on the ground. 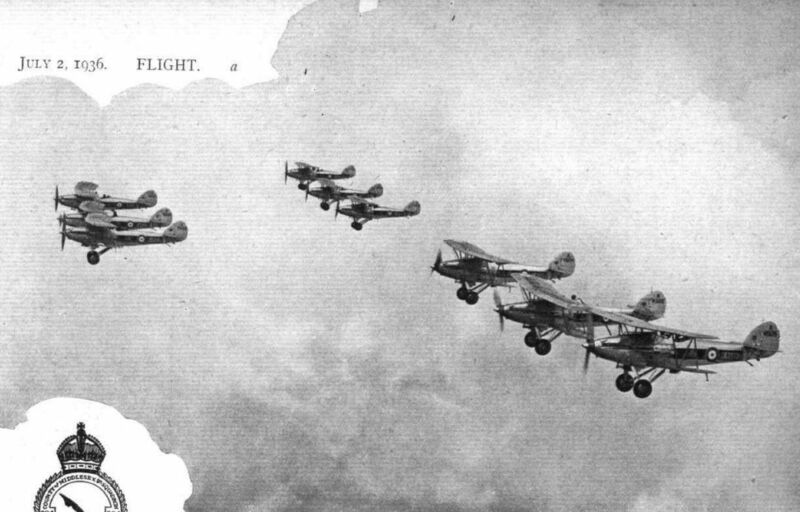 The old and the new: Gloster Gauntlets over two equally famous fighters from another epoch - the Bristol Fighter and the S.E.5s. CO-OPERATIVE: Ths new Westland army co-operation machine, being slotted and flapped, takes off and lands with conspicuous ease. 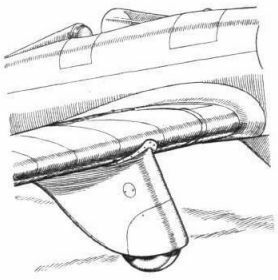 At the moment the engine is one of the new poppet-valve Mercuries, but a sleeve-valve Perseus will eventually be substituted. A glimpse of the 2s. 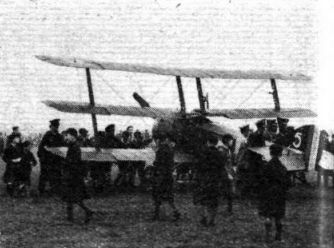 enclosure, with four Heyfords taking off. 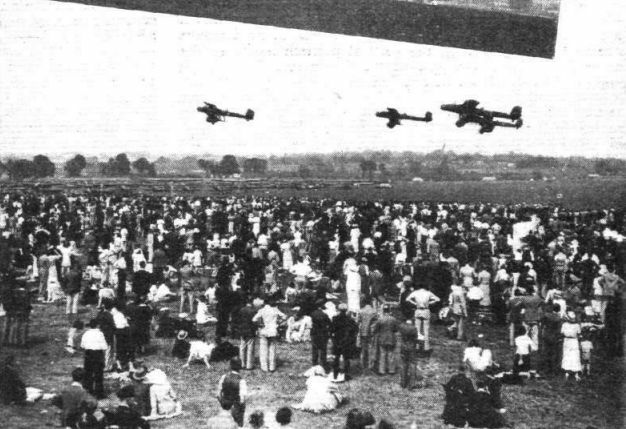 The scene at Mildenhall on the arrival of the King, with a background of Hinds and Heyfords. 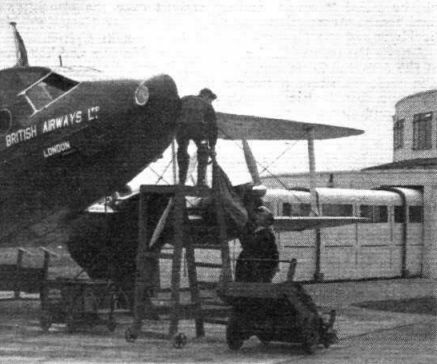 UBIQUITOUS: A D.H. Dragon Rapide, used by Canadian Airways on the daily Seattle-Vancouver service, parked in front of the administration building, Boeing Field, Seattle, Wash. An interesting feature of this Rapide is the increased fin area necessary when floats are fitted. 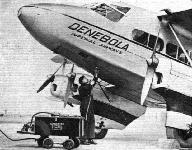 The other machines will be recognised as a Lockheed Electra 10A of Northwest Airlines and a Boeing 247D of United Air Lines. 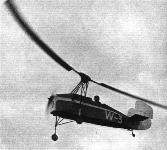 The C.30 Autogiro with two-bladed rotor and autodynamic rotor head. 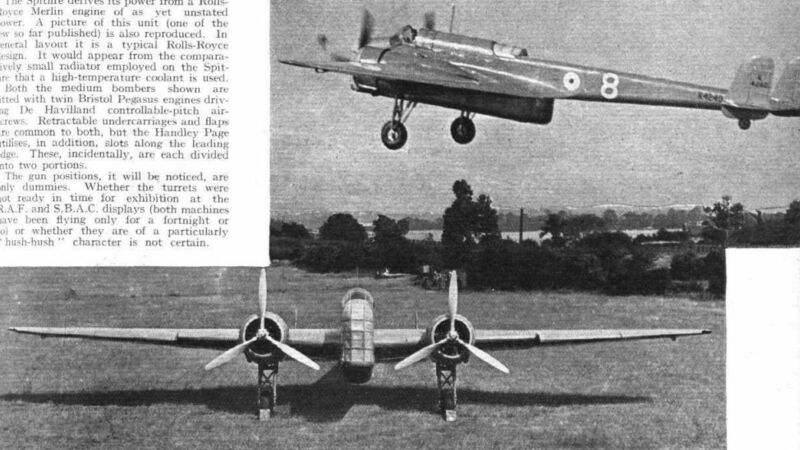 The view on the left, showing the take-off, gives the impression that the machine is almost without visible means of support. 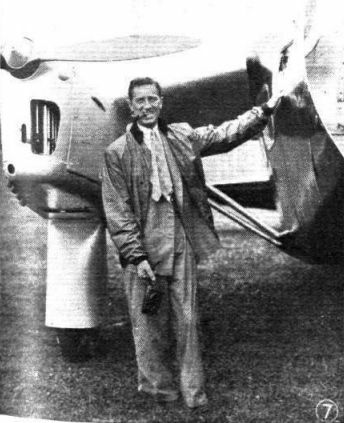 Mr. H. A. Marsh was the pilot. 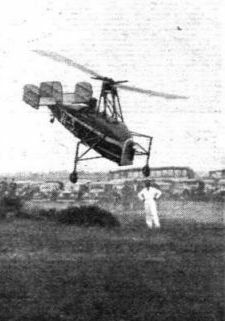 MORE JUMPS: A vertical take-off by the latest C.30 Autogiro. 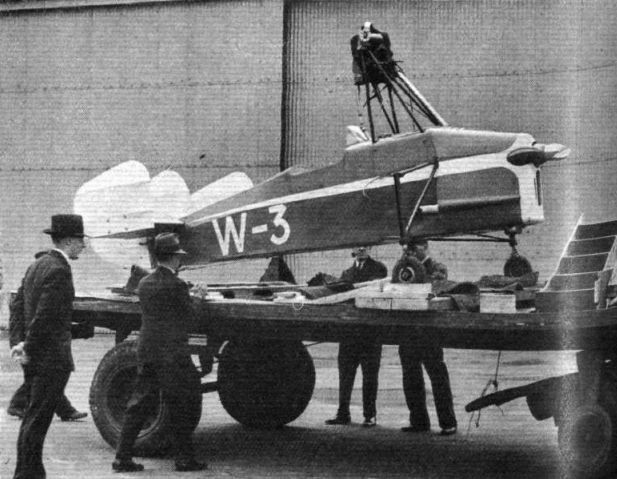 Various components of this experimental machine are heavier than they need be, with the result that the gross weight is the same as that of the ordinary C.30 fully loaded. In spite of this, jumps of forty feet in height have been made. 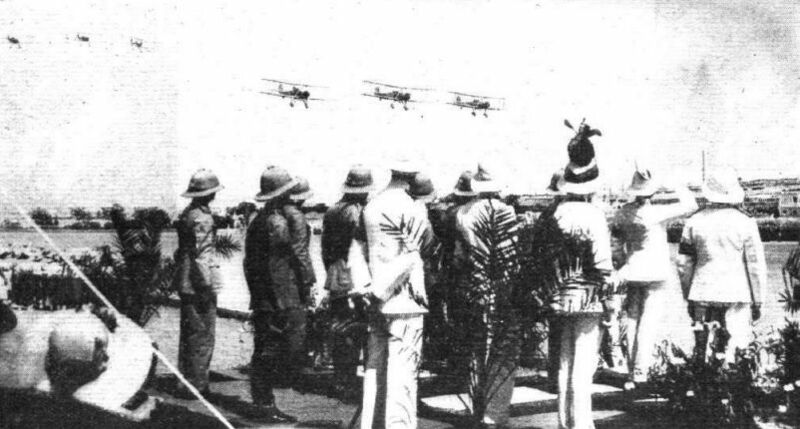 AT SINGAPORE: His Highness the Sultan of Johore about to fly as passenger in an Audax with Sqn. Ldr. L. H. Flinn, Royal Air Force Station, Singapore. It will be remembered that last year His Highness made a gift of ?500,000 for Imperial Defence, of which ?100,000 will be devoted to the construction of buildings for the Straits Settlements Volunteer Air Force, of which Sqn. Ldr. Flinn is O/C. 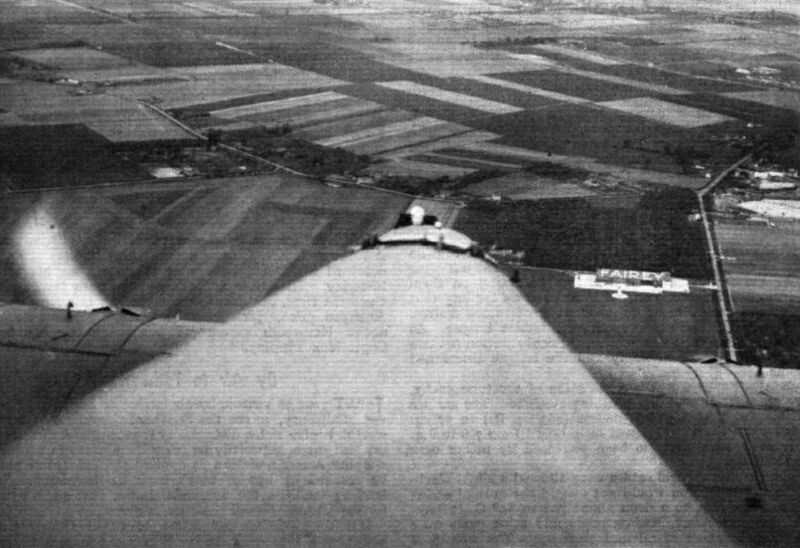 PLAN FORM: One of the new Fokker C.X light general purpose biplanes (Rolls Royce Kestrel V) for the Dutch Army Air Service on a quiet, comfortable test flight above typical Netherlands country. These machines do just on 200 m.p.h. and climb to 16,400 ft. in about 10 minutes. 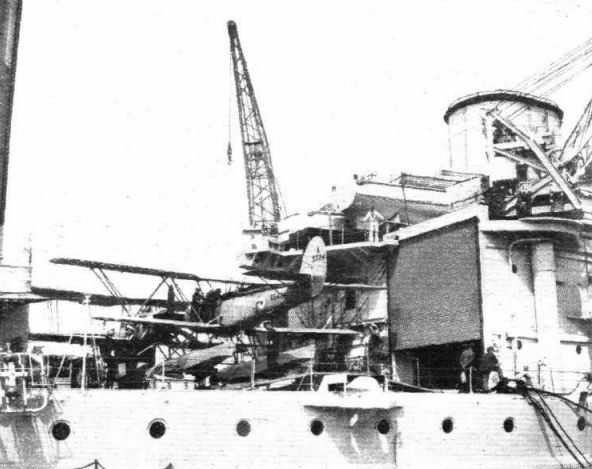 REPULSIVE ARMAMENT: A Fairey Swordfish and a Blackburn Shark are now carried on the battle cruiser Repulse. They are housed in special hangars, one of which is visible in this view. 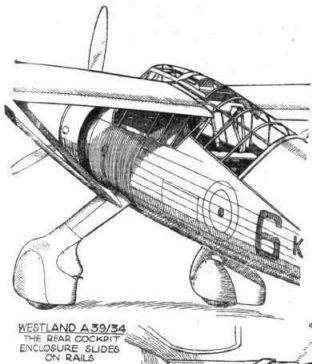 A GAY CO-OPERATIVE GORDON: This picture from an Asiatic desert is probably the first of a Fairey Gordon general-purpose machine equipped with a hook for collecting messages from ground forces. The verticals (sometimes formed on actual service by rifles with their bayonets stuck in the ground) seem reluctant to part with the message. 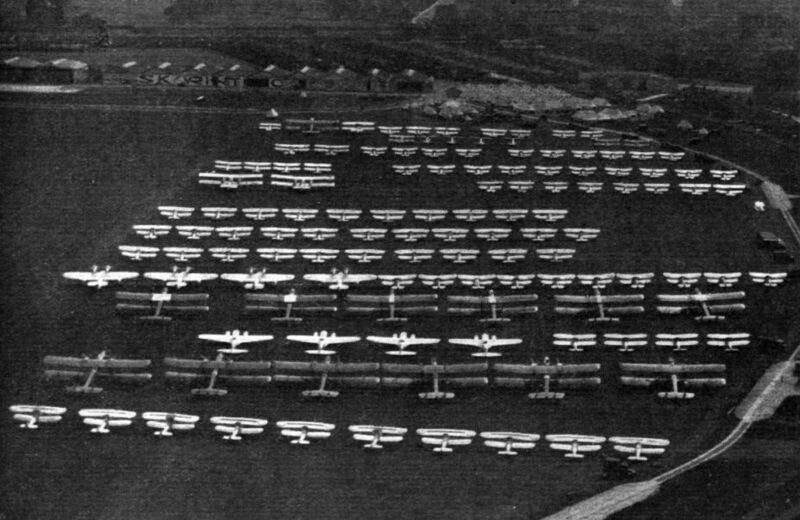 THE STAGE SET: This aerial photograph of the Royal Air Force Display machines assembled in the operational park at Hendon forms a fitting introduction to the pictures, in the ensuing pages, of the Display in progress. 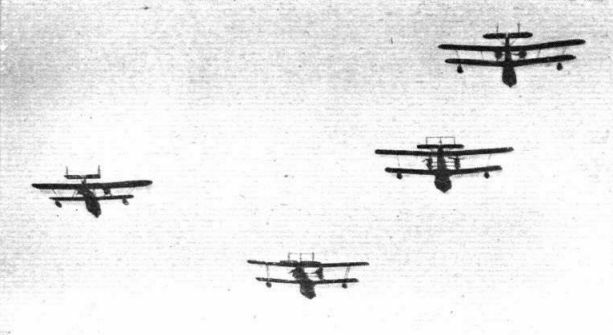 There are eight monoplanes in the assembly - Ansons (third row) and Clouds (fifth). 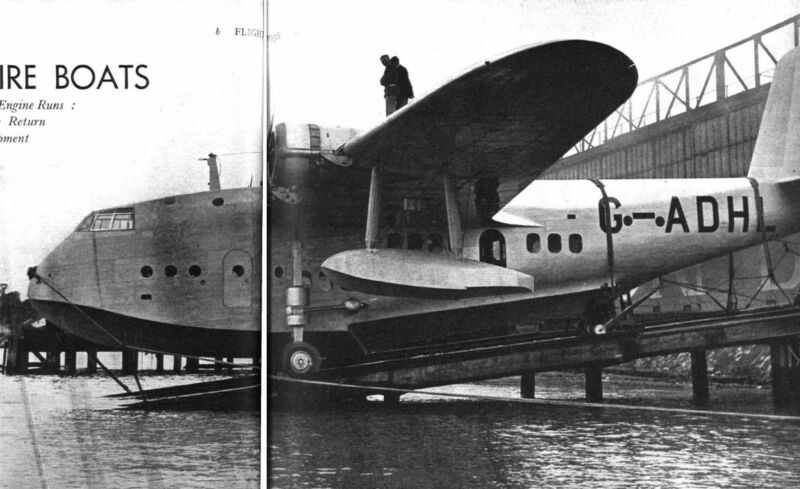 Visitors from the seas: the Saro London, two Short Singapore IIIs (centre) and the Supermarine Stranraer. SEAFARER: The first machines of a batch of Supermarine Stranraer flying boats will soon be seen at Southampton. This is the latest version of the prototype, with 840 h.p. 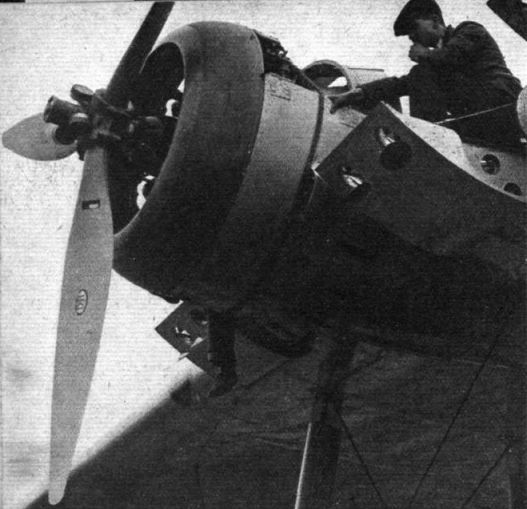 Pegasus Xs in place of the earlier IIIs, and three-bladed Fairey airscrews. 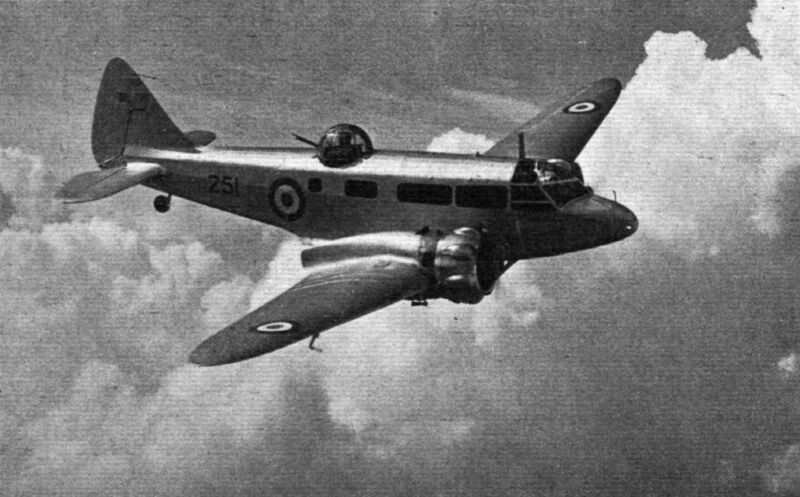 The Avro Anson (two Siddeley Cheetahs) is a general reconnaissance type now equipping R.A.F. 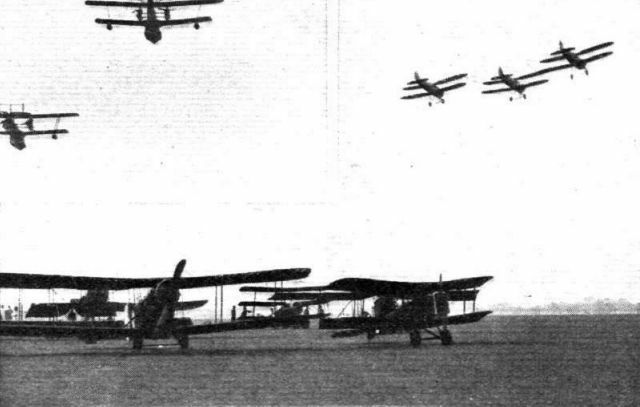 general reconnaissance squadrons. 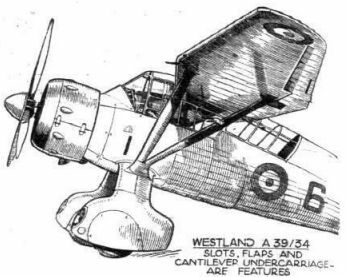 IN MALAYA: Vickers Vildebeest aircraft of No. 36 (Torpedo - Bomber) Squadron flying over the country round Singapore. 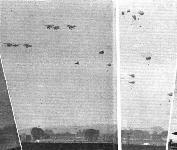 THE KING'S BIRTHDAY AT MALTA: A squadron of Vickers Vildebeests flying past H.E. the Governor, Sir Charles Bonham-Carter. His Majesty at the controls of the Bristol 130 bomber-transport monoplane at Martlesham. 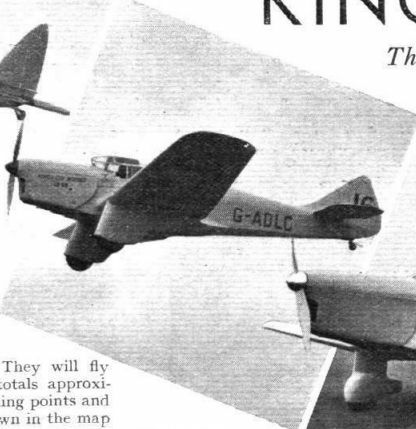 THE ROYAL RAPIDE: A new private aerodrome is being prepared for the King at Smith's Lawn, Windsor. 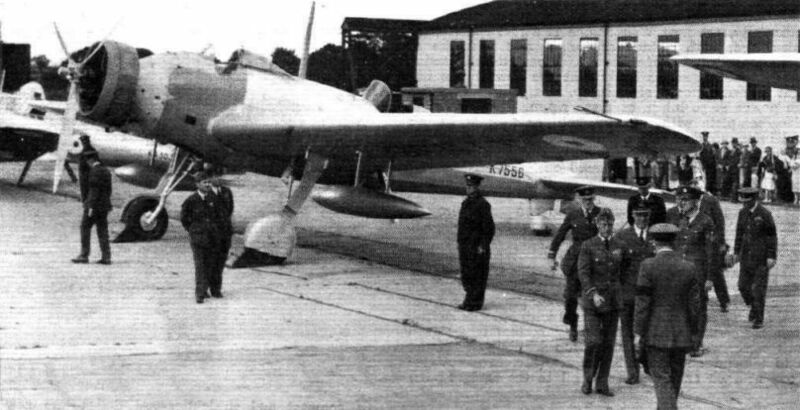 This is the D.H.89 at present owned by His Majesty, and the photograph shows it on the compass base at Hatfield. 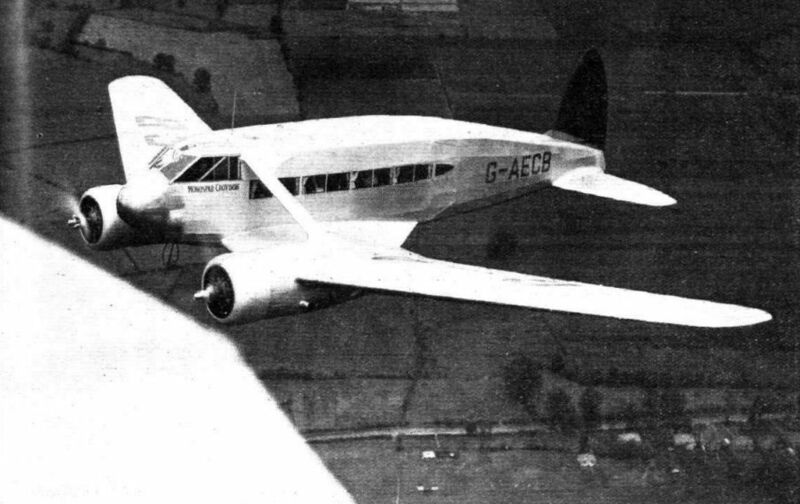 G-ACTT, the other D.H.89 used by His Majesty when Prince of Wales, was sold some time ago to Olley Air Service. Ready for the afternoon's work. The Tutors are lined up and instructors ani members are just going up for solo or dual flights. 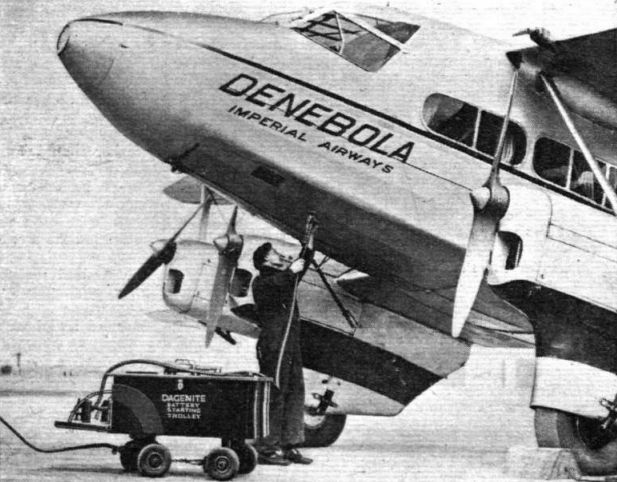 A Dagenite ground-starting trolley in use by Imperial Airways. Its twelve-volt batteries are capable of 489 10-second "starts" at 100 amperes on one charge. 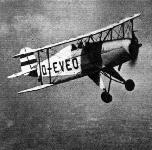 NIGHT MAIL: This country's first real night mail service was opened by British Airways on Monday. 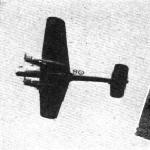 Leaving Garwick at 10 o'clock, the mails reach Stockholm at 8.20 on the following morning. For the moment they are carried by A.B. 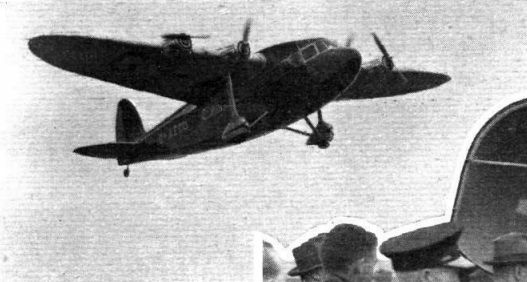 Aerotransport from Hanover. MAILS TO STOCKHOLM: On Wednesday of last week the first direct mail service to Stockholm was opened by British Airways. The machine left Gatwick with passengers and 1,000 lb. of mail. 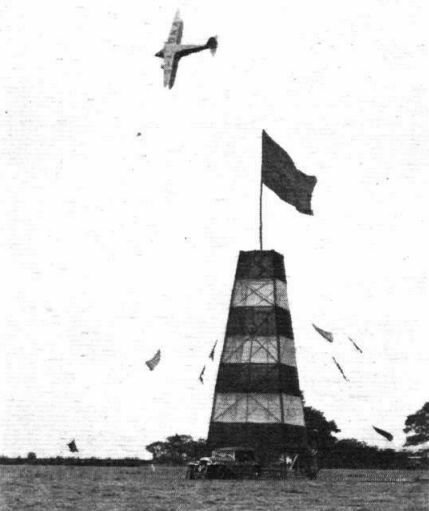 The D.H. Dragonfly gave an impressive demonstration of flying with one engine stopped completely. 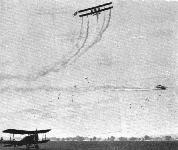 The D.H. Dragonfly (the only biplane in the race) took its turns in grand style. This view also shows the nature of the Sacombe pylon. 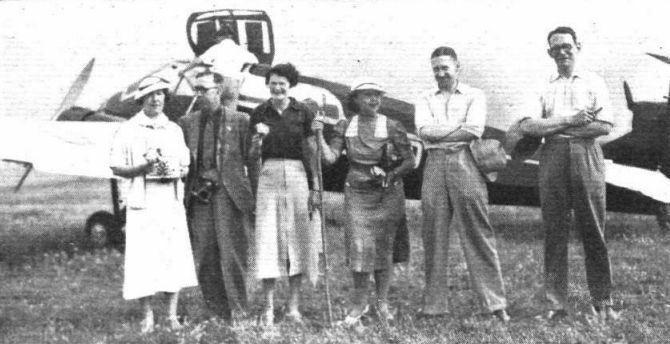 A group of participants: Miss de Paula, Mr. D. R. Pobjoy, Miss Cleyton, Mrs. Pobjoy, Mr. Whitton and Mr. Jackson. 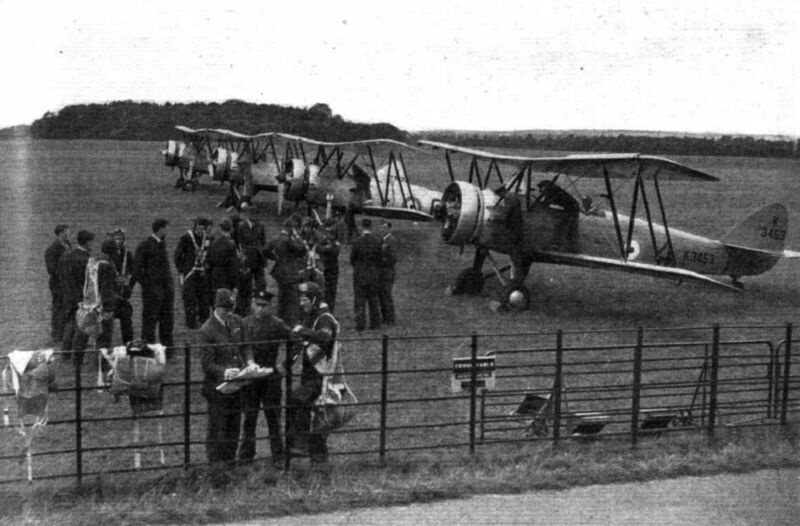 In the background is the Monospar S.T.25 (two Pobjoys) flown by Mr. C. E. Gardner. 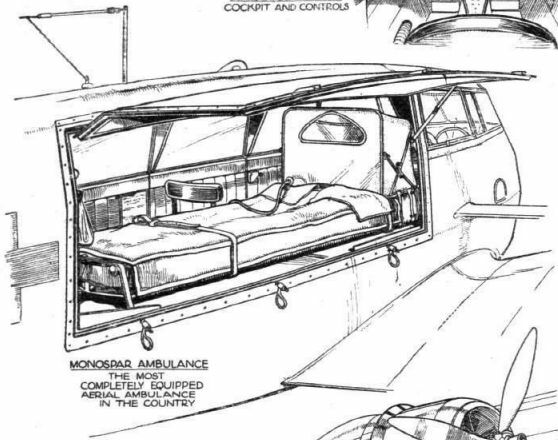 Incidentally, this machine returned in one day, leaving Budapest at 7.45 a.m. and reaching Lympne at 5.45 p.m.
General Aircraft was represented by the standard type 25 and the Monospar Ambulance, Florence Nightingale, both with Pobjoy Niagara engines. THE FLYING SQUAD: Mr. Tapper, of the A.A., used a Monospar S.T.25 to convey his "air scouts" from point to point during the Week-end Aerien, during which event they performed their usual efficient parking and other ground duties. The Controlling Demon: Sqn. Ldr. Gabriel and his Familiar Spirit. 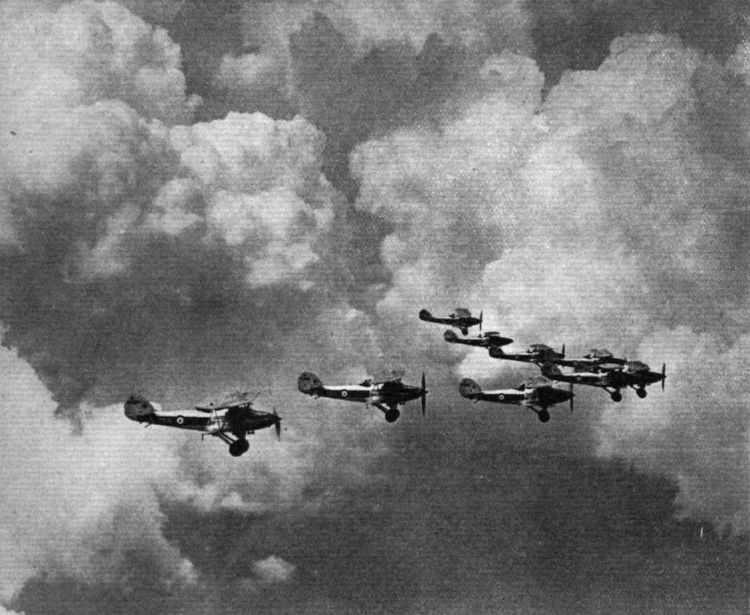 Squadron V: The Hawker Demons of the Squadron against a fine background of clouds. 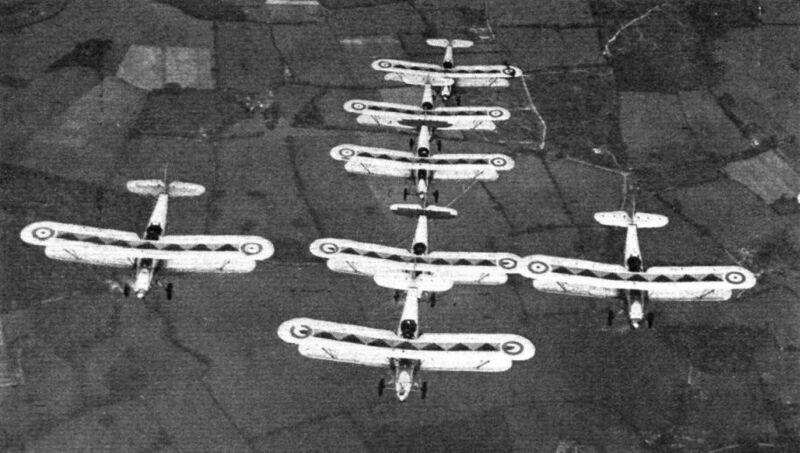 The Spearhead: The squadron in another of its display formations. 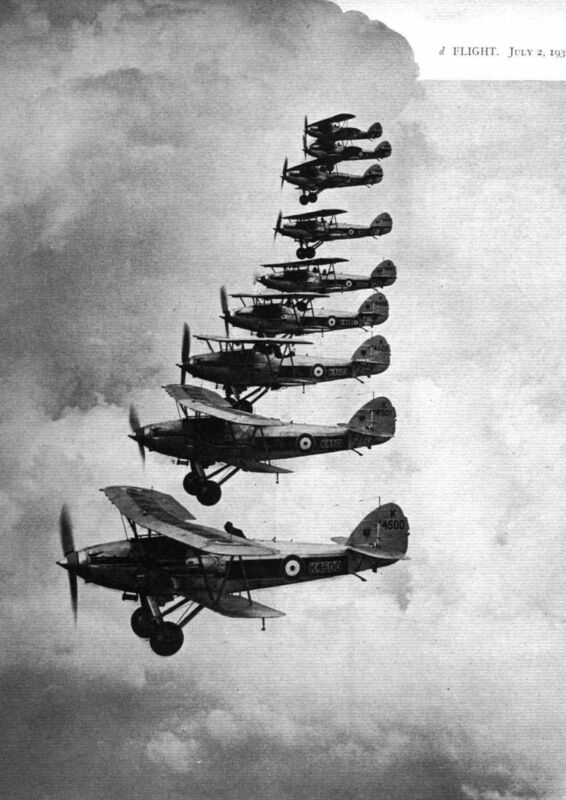 For Hendon Display purposes: An unusual formation by No. 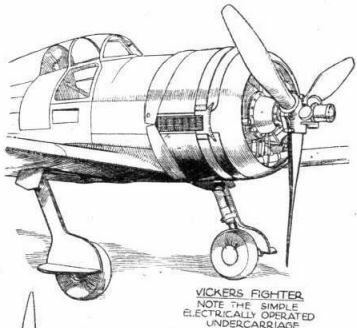 604 (County of Middlesex) (Fighter) Squadron. SYMMETRY in the SKY: An aerial staircase by No. 604: An excellent example of the difficult formation known as "Echelon to the Right, Stepped up." The Heston Phoenix with Gipsy Six engine is the centre of attraction. A "CLEAN" LIGHTWEIGHT: The new Luton Buzzard being flown by F/O. K. G. Stodart at Luton aerodrome. 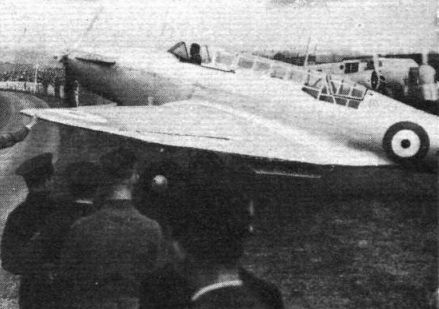 The machine, which was described in Flight of June 18, has a 34 h.p. 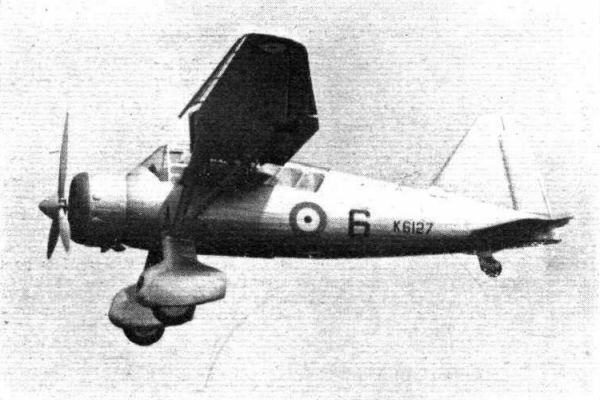 British Anzani vee-twin engine. The Mew Gull at Shoreham on Friday. Snugly ensconced in the cockpit of his pet Mew Gull - Capt. 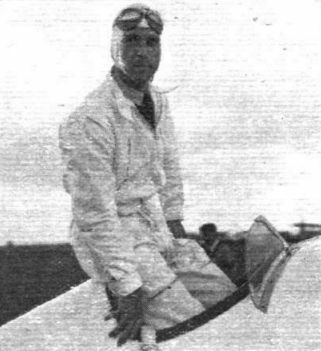 Percival in his complete racing outfit, the two major features of which are a trilby and the well-known smile. 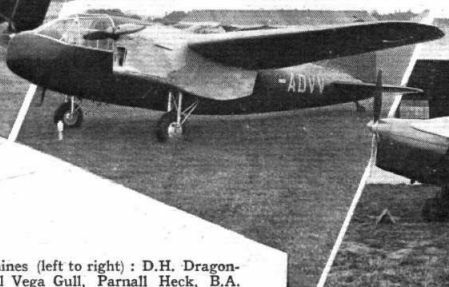 The Percival " family " was represented at Hatfield by a Gull, a Vega Gull, and a Mew Gull. All three machines have Gipsy engines. 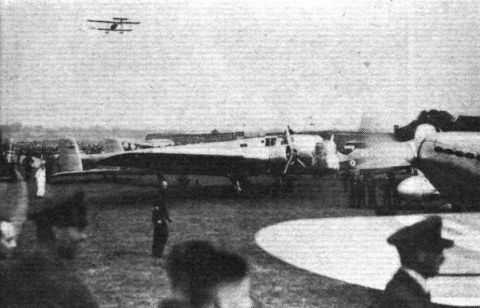 The Vega Gull is in the foreground. 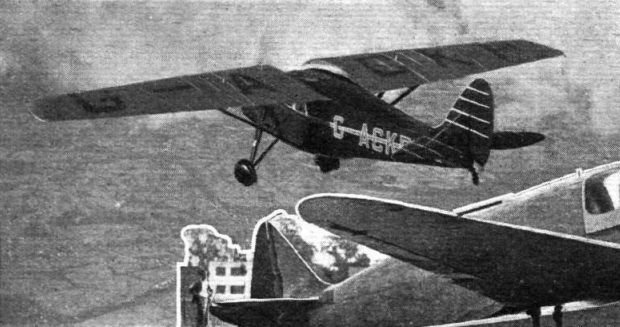 Gardner's victorious Vega Gull taxies in after its grand race. Ministering to Gardner's Vega Gull during the eliminating contest. 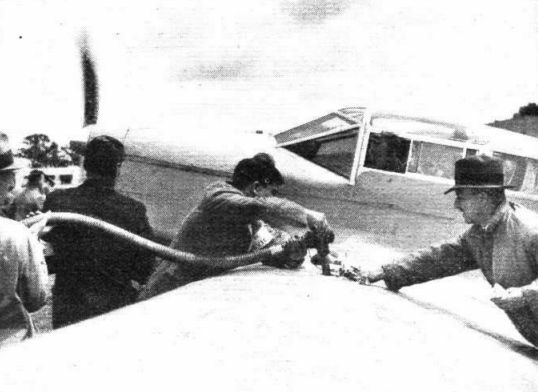 Refuelling was done with the engine running. 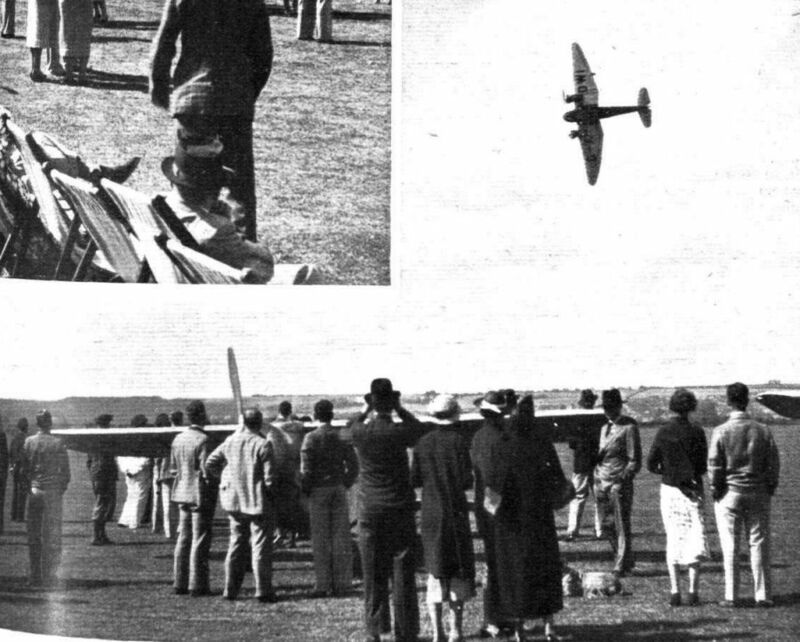 Mr. W. Lindsay Everard's Vega Gull The Leicestershire Fox IV goes to earth at Shoreham. 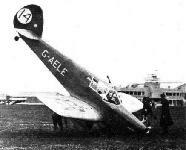 Mr. P. Q. Reiss, its pilot, was turning on the ground when the machine was caught by a gust. 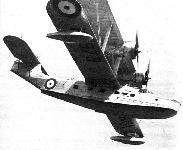 FOR CIVIL SERVICE: The Short Empire flying boat is powered with four of the new Pegasus Xc civil-rated radials, the official figures for which have just been made known. The international-rated power is 740 h.p. at 3,500 ft., and 910 h.p. 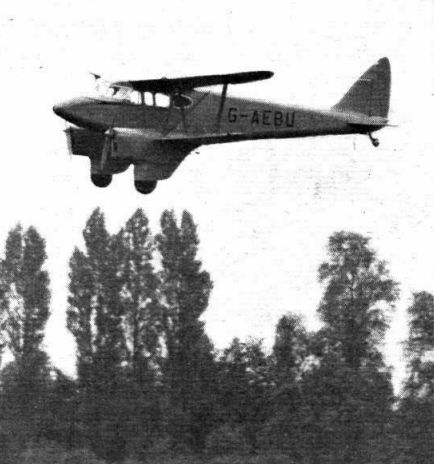 is available for take-off with the De Havilland V.P. 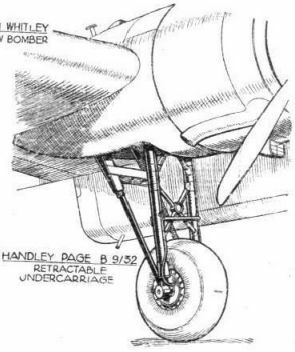 airscrew. 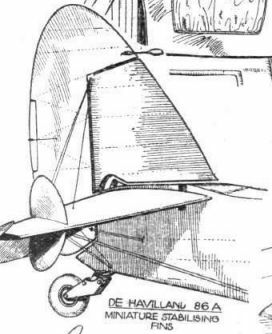 Flaps for controllable cooling are incorporated in the long chord cowlings. 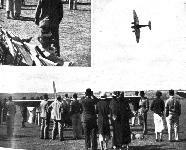 This Flight photograph was taken during the second test flight at Rochester. 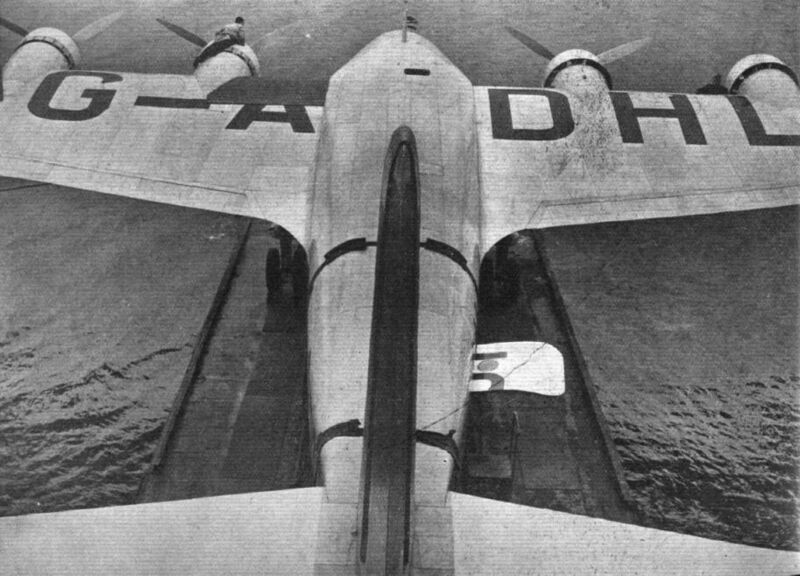 For the Empire air routes: The bird's-eye view gives a good idea of the rounded deck, the wing fillets and the trailing-edge flaps of the first of the new boats. The open door leads to the freight and mail hold. One of the hinged platforms used for giving access to the Bristol Pegasus engine. 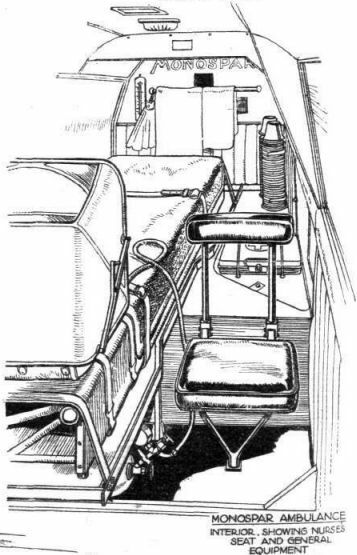 One of the beaching trolleys. PASSENGERS OVER THE ATLANTIC: This is the new Loire 102 (four Hispano 12 XBRS 720 h.p. engines) designed for the Air France South Atlantic service and in which passengers will be carried for the first time. 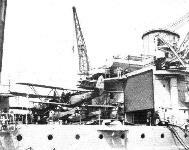 It is expected to be capable of carrying 1,000 kilos on the crossing at a speed of 170 m.p.h. The maximum is 194 m.p.h. 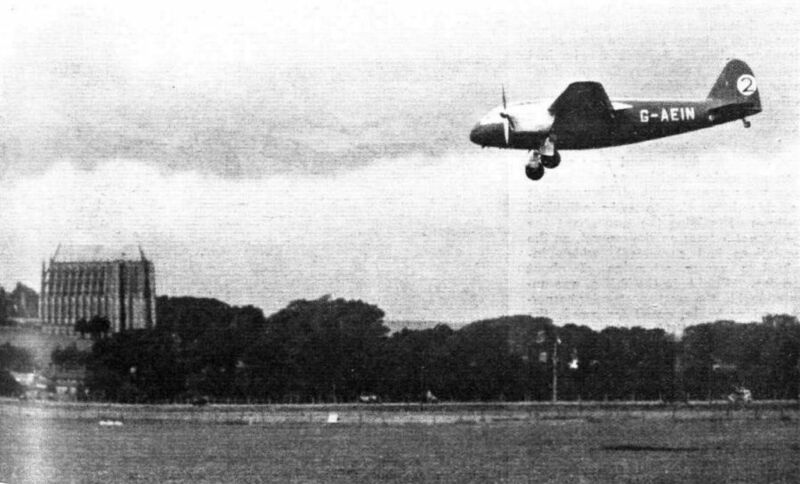 and preliminary test flights have already been carried out. 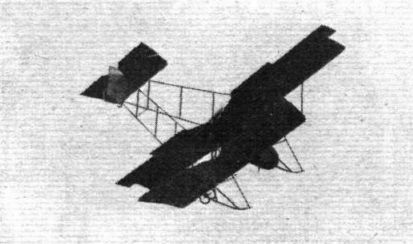 M. Eugene Wittinne's Caudron Simoun, which was flown by M. Vanlaere. 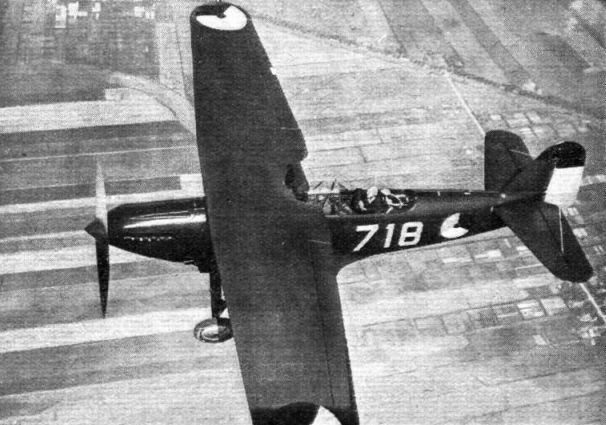 A GERMAN SINGLE-SEAT TRAINER, the Bucker Jungmeister. Built on rather similar lines to the Bucker Jungman described in Flight of May 28, it is fitted with a more powerful engine - the 140 h.p. 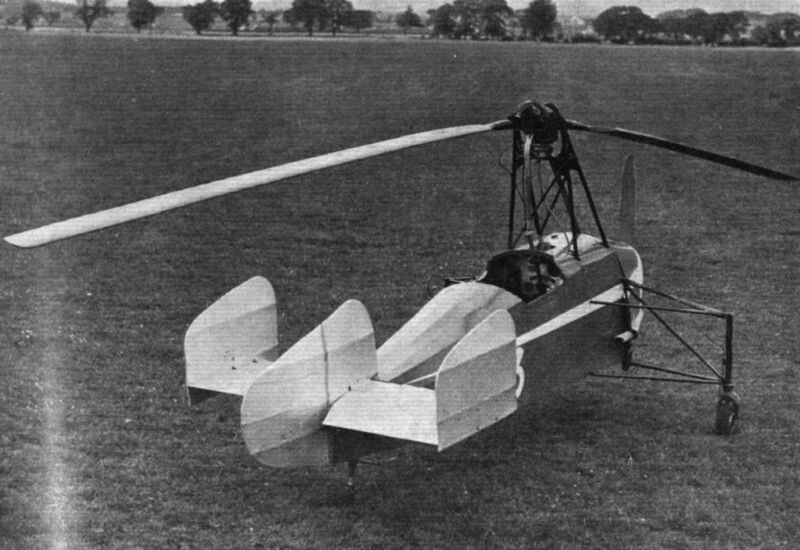 six-cylinder Hirth - and has a top speed of 143 m.p.h. The cruising speed is 124 m.p.h. and its landing speed 50 m.p.h. The makers are Bucker-Flugzeugbau G.m.b.H., Rangsdorf bei Berlin. 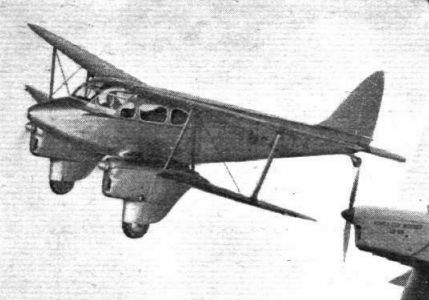 THE HAMMOND AGAIN: This is the production version of the Hammond Y, one of the "fool-proof" designs which have been built to the U.S. Bureau of Air Commerce orders. 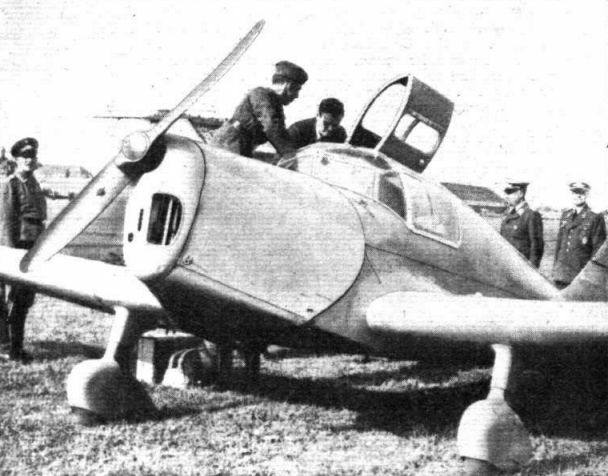 It was originally described in Flight of December 6, 1934, and the revised model is reputed to have a maximum speed of 123 m.p.h. The engine is a 125 h . p . Menasco, which may yet be produced in this country. 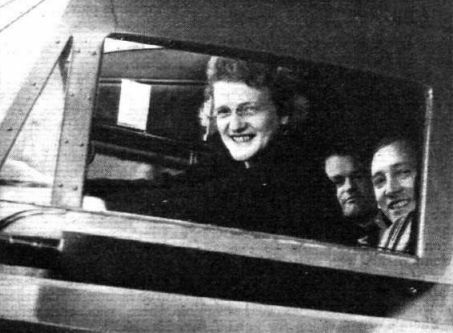 Miss Bessie Owen, a visitor from the U.S. (not direct by air), in the cabin of her Waco. 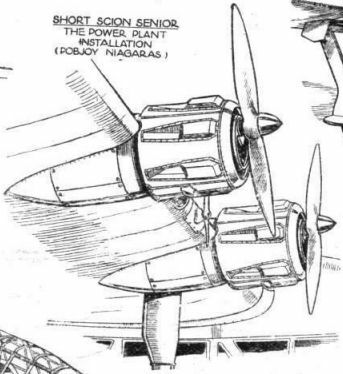 The new Short Scion Senior with four Pobjoy Niagara engines appeared at Hatfield for the first time as a landplane. 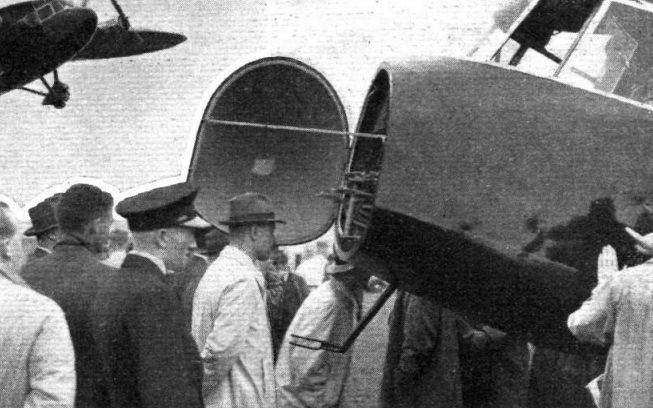 The hinged nose of the fuselage permits inspection of the flying controls, instruments and other equipment, and attracted a good deal of attention. The B.A. Eagle. This type will be flown by Mrs. Mollison. TRIPLE ALLIANCE: A Miles Whitney Straight was used by Col. Lindbergh for his visit to Berlin last week. 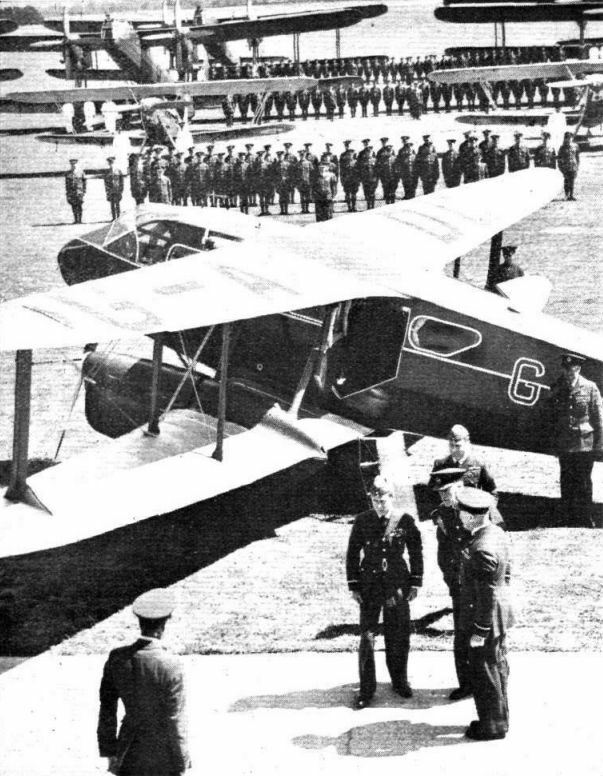 He is seen arriving at Staaken Aerodrome, where, with Mrs. Lindbergh, he was welcomed by Col. Kassner on behalf of General Goering, and by Herr Wolfgang von Gronau, president of the German Aero Club. 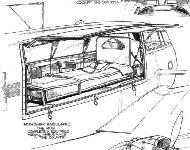 Were it not for the rear gunner's turret it would be impossible to distinguish this military version of the Envoy from its civil counterpart. 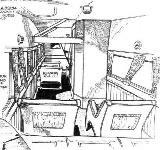 The covered forward gun trough can be seen below the control cabin. 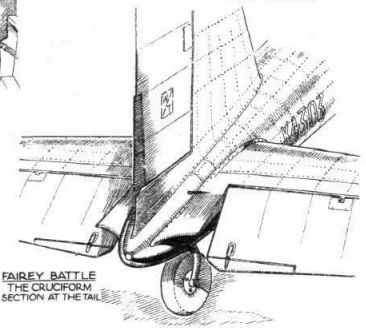 The field of fire provided for the rear gunner can be visualised in this picture, which also shows the useful fact that the undercarriage, when retracted, can still be used for emergency landings on rough ground. Although actually flying at 10,000 ft above the thunder clouds, Fit. 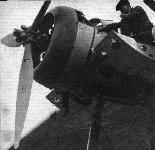 Lt. Colman lowers the undercarriage and flaps of the first South African Envoy for the benefit of Flight's photographer. 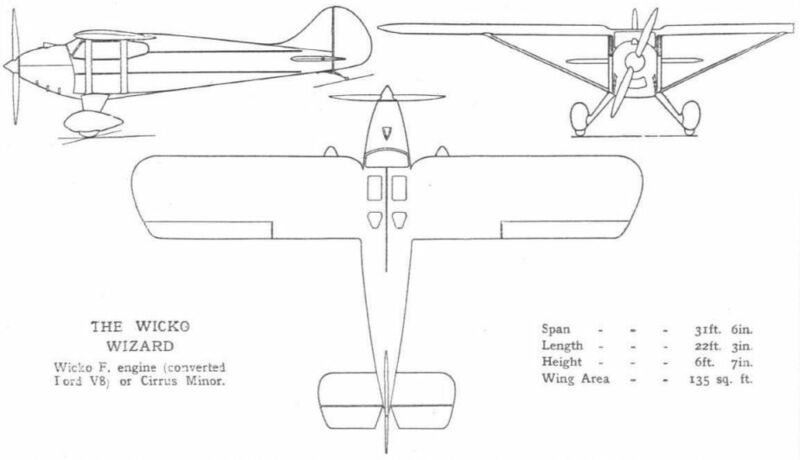 Types of competing machines: Comper Swift. Mr. S. T. Lowe who, with his Comper Swift, won the Portsmouth - Shoreham - Portsmouth race which replaced the Isle of Wight event. Tne Monospar Croydon on a demonstration flight last week, with Fit. Lt. Schofield at the controls. 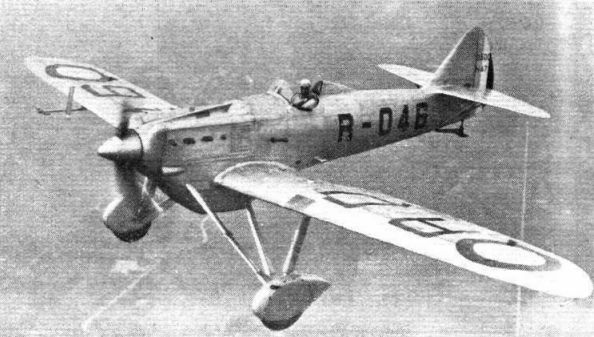 The Potez sesquiplane in which Mile. 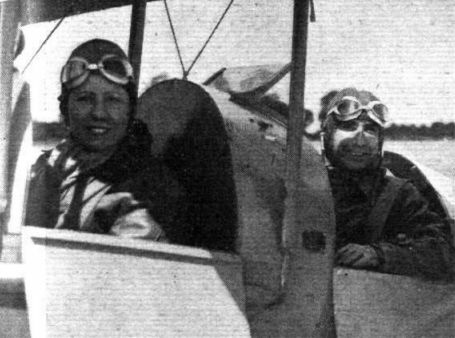 Hilz (right) obtained her record. LIVERPOOL LIKES THEM! 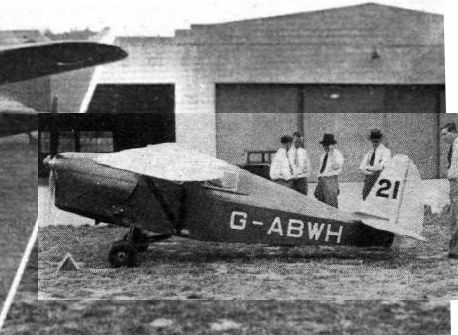 Members of the Liverpool Aero Club with the two B.A. Swallows of which they hare just taken delivery. In the group are Fit. 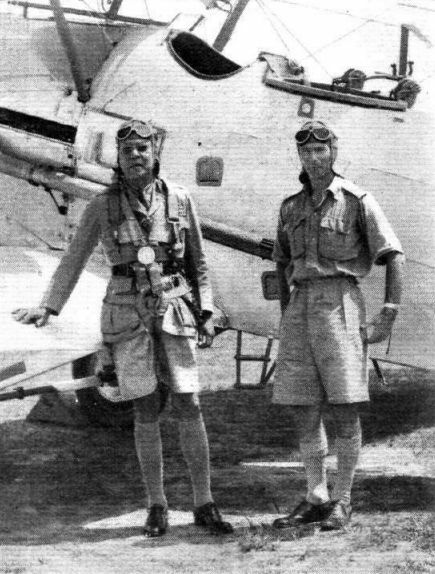 Lt. G. Clapham (instructor) and Major Nicholls (secretary). Liverpool, incidentally, is the twelfth club to use Swallows. 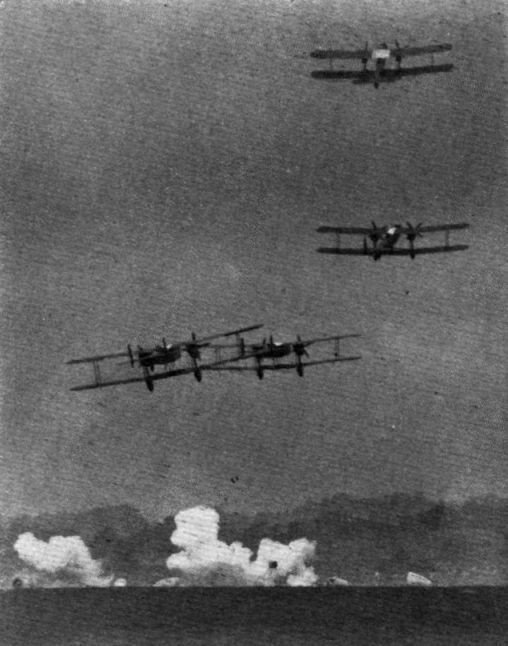 These remarkable photographs, taken by Mr. W. E. Gray in a B.A. Swallow, show the behaviour of wool tufts on the wing as a stall - incidentally, an extremely innocuous and controllable one - develops. The N.S.W. 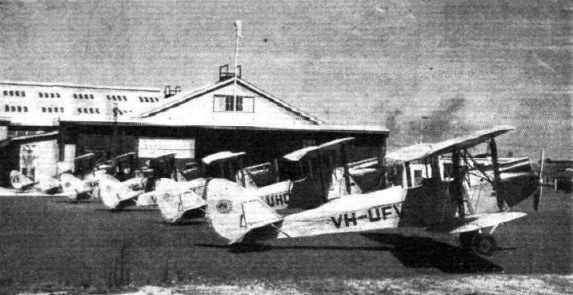 Club's fleet in front of the hangar at Mascot. Mme. 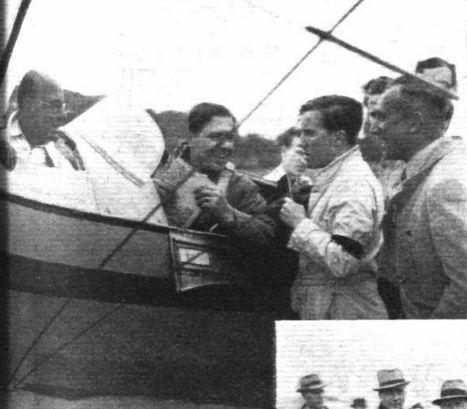 P. du Jardin and M. Edmond Leon, who came in the original Moth Major. The new B.A. 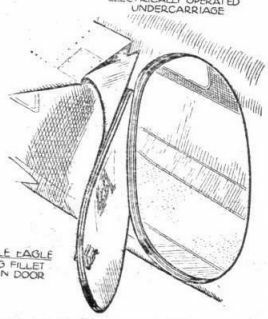 Double Eagle with two Gipsy Majors has a very unusual wing arrangement. A pleasing "shot" of Fit. Lt. Wilson's Double Eagle coming in at Shoreham on Friday with the stately chapel of Lancing College in the background. KING'S CUP CAMEOS Caught by the Camera at Hatfield. A King's Cup veteran - Capt. W. L. Hope. (B.A. Double Eagle), unluckily eliminated by fuel-system trouble on Friday. 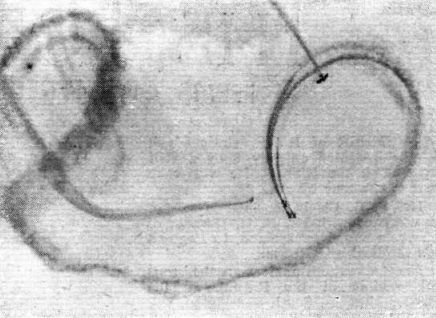 The left-hand sketch reveals in detail certain of the features of the B.A. Double Eagle. To the right is a close-up of its retractable undercarriage. A jump-start by the little Weir W.3. 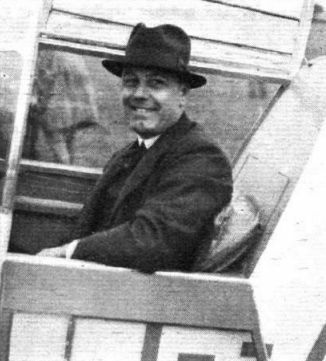 Mr. H. A. Marsh was the pilot. "The Cow Jumped Over the Moon." 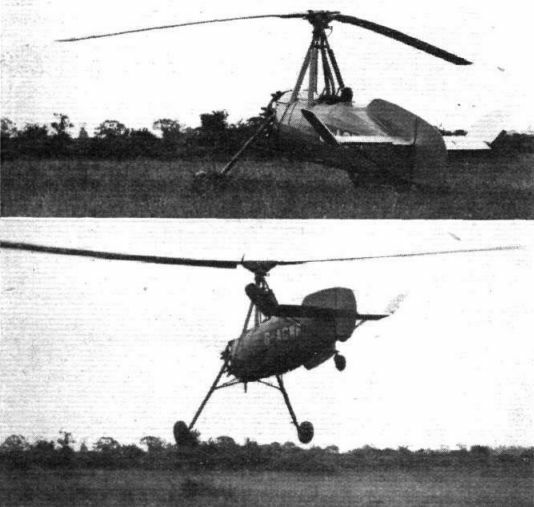 These pictures from a cine film, secured by Flight's photographer, show ten stages in the take-off of the new Weir Autogiro. The time-lapse between the first (top left) and the last picture is 2 1/4 seconds. Note that at first the machine rises vertically, and then begins to forge ahead. Three vertical fins are used for directional stability. 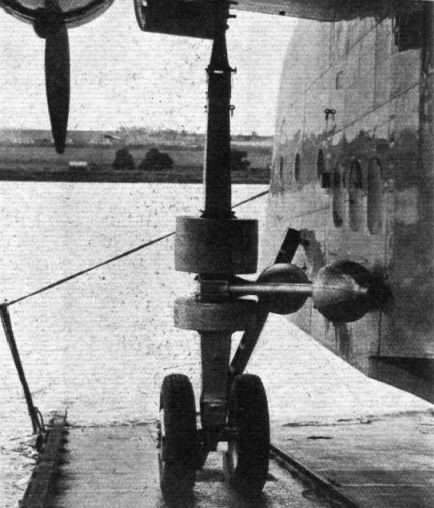 The central rudder is fitted for experimental work only. The picture of the machine on a lorry gives a good idea of the small size. In the "office" of the W.3. The central stick is the flying control. 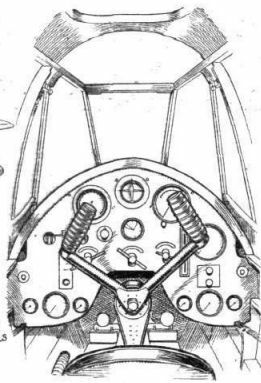 In the gate on the left, pulling the lever into the first slot engages the rotor head drive, into the middle slot engages the clutch, and into the left slot applies the wheel brakes. All three are released simultaneously by pressing the button on the front of the gate. 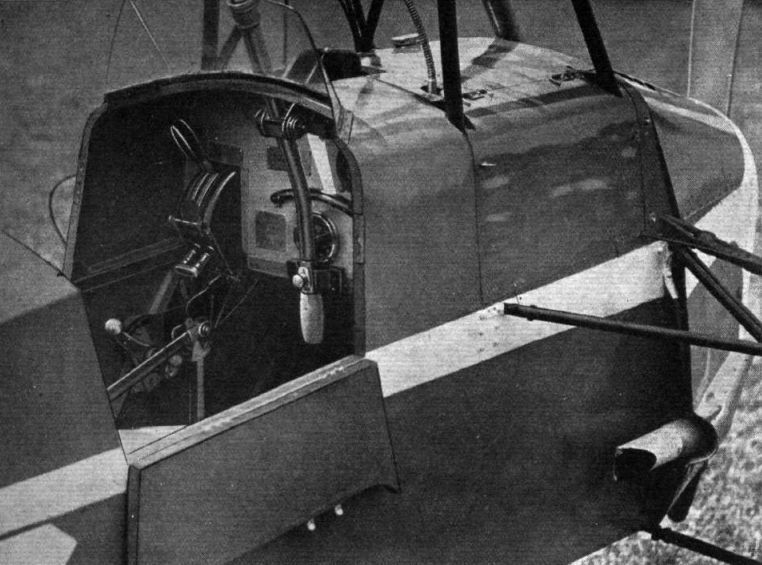 The rotor brake is operated by the separate lever below the gate. The Icar Universal, being started before a trip to Oxford.